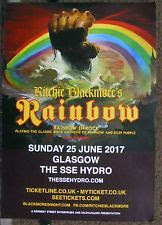 I really don’t think many of us expected this: Ritchie returning to rock, after two decades of pastoral lute and domra noodling with Blackmore’s Night. But here he was, a sprightly be-wigged and pencil-moustachioed septuagenarian, churning out those well-loved riffs and solos like a good 'un. It all could have been a bit of a train smash though, had it not been for the vocal prowess of Chilean born singer Ronnie Romero - who generally coped admirably I felt with the daunting task of having to, if not quite replicate, then certainly interpret, the original performances of, if my arithmetic is correct, five (Gillan, Coverdale, Dio, Bonnet, Turner) predecessors. His work on the Ronnie James Dio tunes Man on the Silver Mountain, Sixteenth Century Greensleeves and Temple of the King was particularly impressive. The Stormbringer track Soldier of Fortune was given an airing midway through the set, and although Romero did just fine, I felt RB could have got his wife Candice Night to sing this one. She and her co-backing singer mate spent the evening jiggling away at the back, any vocal contributions they made being utterly lost in the decibels. Romero also enjoyed a passable stab at Ian Gillan's trademark scream on Child in Time, but didn't quite hit the mark I felt; the exertions of attempting to do so perhaps affecting his subsequent performances, as there were distinct wobbles on both Stargazer and Burn. Not that I minded too much – these are both such Blackmore masterpieces, I am sure the guitarist could have got away with performing them as instrumentals. The only low point of the evening was Jens Johansson's lengthy keyboard solo during Difficult to Cure which, after opening with some pleasing noises that sounded not unlike that World in Action TV theme, just meandered on and on and on, killing the atmosphere inside the venue. I am all for tolerating a little interlude midway through a show to allow musicians off for a pee break (particularly those of a certain vintage, whose bladder control may not be what it once was), but this was (ahem) just taking the piss. The final song was, inevitably, Smoke on the Water. That riff truly does deserve the adjective “iconic”, but this really was such a perfunctory run through that I am sure Mr Blackmore – like myself – probably regards the tune these days as a bit too much of a Spinal Tap-esque cliché. I should have much preferred Highway Star, Gillan's gumby lyrics and all, but Hey ho. Acoustic strumming and a seat during Soldier of Fortune. RB and drummer David Keith. I don't recall RB having his guitar slung so high back in the day. A consequence of his Blackmore's Night days, perhaps. Support act were the Proggy/Folkie/Rocky Mostly Autumn.